When it comes to creating that cute summer outfit look, the possibilities are limitless. The following includes 30 cute summer outfit ideas. With these ideas to choose from, you won’t break the bank, yet you still will be the envy of others. This is a very pretty and comfortable, sporty look goes a long way. With white sneakers, a black and white, hoodie minidress, and a pin-up ponytail, you will look like a million bucks. You will also be the envy on the go. With the stonewashed and ragged denim shorts, a fabulous, grey top, and awesome, matching shades, you are ready to rock the town. And even more importantly, you will maintain an awesome look while remaining casually cool in the humid weather. Who says overalls have to look plain and bulky? This look says otherwise with the overalls being shorts and having the ragged look. To top it off, put on some stylish white sneakers, a white midriff, contouring top, and stylish shades. This look screams total sophistication while remaining cool and comfortable. This look consists of a satin-looking, ankle pants with a tie belt. It also includes a matching colored, handbag, color-coordinated heels, a white, contouring midriff top with spaghetti straps, and small, shiny hoop earrings. This look is amazing from top to bottom. It comes with a brownish, top with a pocket. It also comes with the matching, slipped on, flat sandals with an amazing design on top, stylish shades, and denim shorts with folded hems. Even when you need to slip on something fast, but you want to look intact, you can try this look. 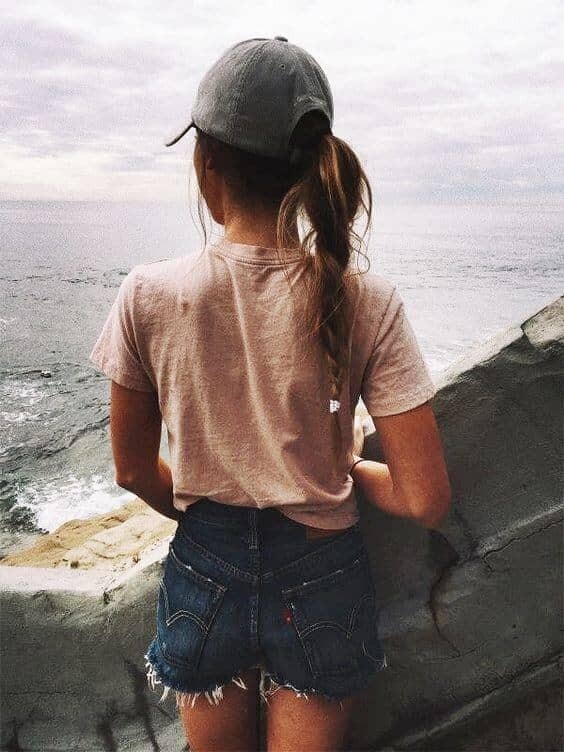 You can put on denim shorts, a lightly colored T-shirt, and a baseball cap. Sometimes, less is more as with this style that has a sporty and cool appeal. Trunks are not just for the beach as shown here. With this extraordinary look, you must color-coordinate accordingly with the shoes, accessories, and hair. This multi-colored shorts with the base color being brown, color-coordinated the look with brown, slipped-on heels, a lightly-brown top, a gold necklace, and a brownish-looking bracelet. You don’t have to be really matchy to be stylish. You don’t even have to be traditional as shown with the hem. With the white, spaghetti straps top, the denim jacket and jeans mini skirt, this look is chic along with the pinned up bun. This amazing, jumpsuit short set can be dressed up or down. With this jumpsuit short set, you don’t even have to be really matchy for high style as shown here with the brown heels. You will stand out in the crowd with this look. You’ll definitely look like you have it all together with this style. With the ruffled, off-the-shoulder blouse, white, legging slacks, sandals, and color-coordinated accessories, you’ll look awesome with this look. The purse, jacket, and suede-looking sandals color-coordinate amazingly with the blouse, while the watch and sunglasses match the pants. 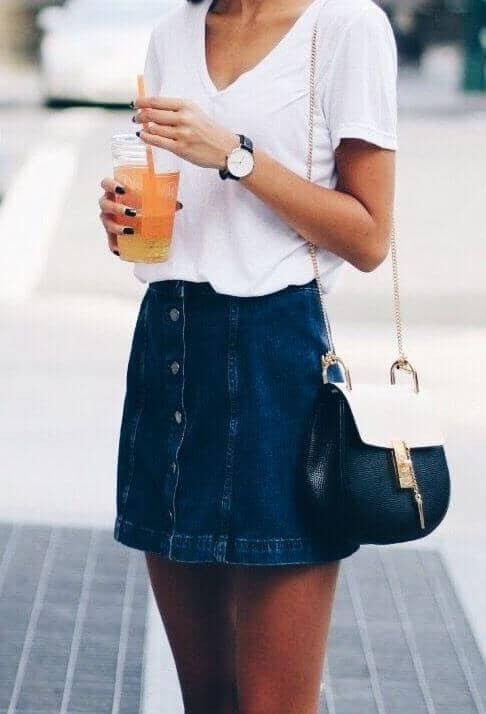 This is an edgy and sassy look that is the ultimate in cute summer outfits from the stylish, denim shorts with a folded hem to the low cut, button down, satin-looking shirt. The look is edgy, even down to the bottom part of the pockets being displayed. Look really pretty as a princess with this fashionable, white jumpsuit short set. With this white, jumpsuit short set, you can match it up with any color with accessories, nice jewelry, and a nice hairdo as shown. Others will look at you with admiration and envy. You can remain sassy and chic while on the go with this cute summer outfit. It comes with a button down, mini, blue jean skirt. It also comes with a black, off-the-shoulder blouse. Also, the shoes and the handbag are color-coordinated. Less is more many times as shown with this pretty style. This comfy, loose-fitting blouse is light brown with a pleated, ruffled bottom and spaghetti straps. The fashionable sunglasses, relaxed hairstyle, and really short, white shorts finish this style off. Another out-the-box overalls look that shows overalls don’t have to appear plain and bulky. With the overalls being shorts with a folded hem, a nice top, brown sandals, a brown, cowboy hat, and a brown handbag, this look is amazing. This is a sassy and sophisticated style that consists of a colorful, loose-fitting blouse with a low V-cut, blue jean, ragged leggings, and wedge-heeled, slip on sandals. The look is topped off with wonderful gold jewelry and a pretty hairstyle. This style revolutionalizes the denim shorts style. 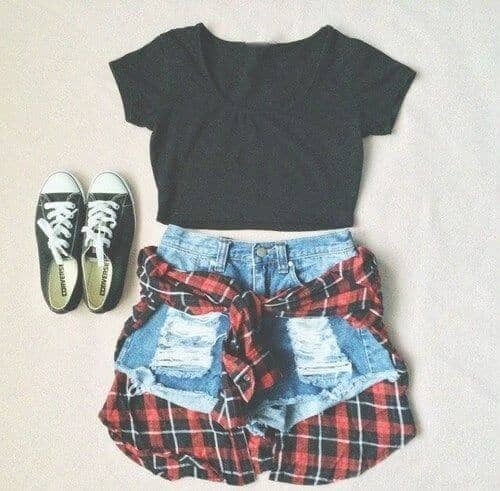 The stylish, acid-washed, ragged, denim shorts with a folded hem and the black, midriff top is cute by itself. However, this style is definitely on fleek with the mainly black sneakers and red and black, checkered shirt tied around the waist. This is a comfortable, casual style with the stylish, denim shorts with a folded hem and the bottom part of the pockets being displayed. To complete this look, an over-the-head, grey hoodie top and a unique, silver necklace are added. You will look well-put-together in this pretty, sleek, and chic style. Keeping it simple goes a long way in being sleek in high fashion as shown here with a hunter green top, really short, black shorts, a black belt with a gold buckle, and gorgeous, black shades. Less is more many times as shown with this pretty style. This is a comfortable, casual style with the stylish, faded, ragged denim shorts. To complete this look, a pink, hoodie sweater, and a white tank top with a bracelet. This is a very pretty and comfortable, light pink minidress. Another less is more look that goes a long way. What really set this look in hi-class chicness is the thigh-high boots and the long, flowing hairstyle. This look will really turn heads. Even when you need to slip on something fast, but you want to look intact, you can try this look. You can put on denim shorts, a spaghetti strapped top, and a cute handbag. Also, having a nice, wavy hairstyle will complete the look. You will really turn heads with this hot and sassy style. This is a really pretty and comfortable, grey and white minidress with a unique design that ties in the front. That distinction with a few accessories and nice hair complete this look in hi-fashion. Less is more many times as shown with this well-put-together style. This is a comfortable, casual style with the stylish, faded denim shorts. To complete this look, a sweater, a grey tank top, and Converse sneakers are added. The color-coordinated necklace is an added touch. This is another revolutionalizing denim shorts style in which contours the shape more. The stylish, acid-washed, ragged, denim shorts, a charcoal grey, midriff top, and a black and white checkered shirt tied around the waist with a matching watch completes the look. Can you say, ay caramba? This look is definitely a hot and sassy, highly fashionable style. With this incredible style, you will turn heads, and many will be envious of your look. This red and black, floral dress is flowy and floor-length with a high thigh slit with a black, midriff, top. This is an edgy and rocked-out look that stands out in admiration of your creative unique style. The look is edgy with the black tank top with the wording, the coordination of the greyish-black, acid washed, ripped jeans, and the hair. This is another great look that you can slip on quickly, maintain a great look, and accentuate your shape. As shown here, just put on denim, hug-shaping, and really short shorts, and a form fitting, white, long sleeved top with ripped elbows. You will be pretty, sleek, and chic while on the go with this cute outfit. It comes with a button down, mini, blue jean skirt. It also comes with a white, V neck top. The nails, watch, and handbag complete this awesome style. This look is totally on point from top to bottom. Dressing in all black, the one-piece minidress comes with pleats and no sleeves. The highly fashionable handbag and buckled sandals have the whole style on fleek- a great look for just about any event.